Philadelphia Eagles center Jason Kelce celebrates during the Eagles' first Super Bowl parade. 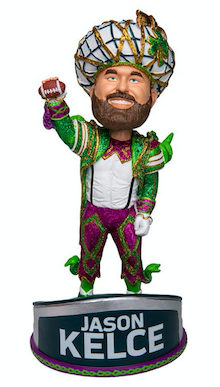 The National Bobblehead Hall of Fame and Museum is selling bobbleheads of Jason Kelce dressed as a Mummer. 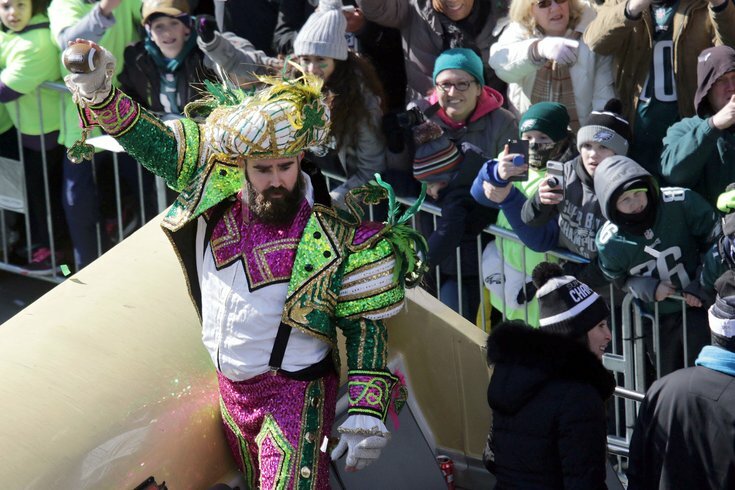 Jason Kelce instantly became a Philadelphia hero when he delivered a rousing speech at the Eagles' Super Bowl parade last month, all while dressed as a Mummer. Now, Eagles fans have a new way to memorialize that historic moment. The National Bobblehead Hall of Fame and Museum is selling a bobblehead of Kelce wearing his Mummers attire, with his right hand held victoriously upward. The collectibles, manufactured by FOCO, can be purchased for $40 via presale. Expected to ship in June, the limited-edition bobbleheads will be individually numbered. After the Eagles defeated the Patriots in Super Bowl LII, the museum began selling a set of Eagles' Super Bowl bobbleheads. As demand soared and the museum experienced record-setting sales, the set eventually expanded to include 40 Eagles. And it hinted that more memorable poses could come. Now, fans can have a likeness of Kelce bobbling on their desk.